Beat the Competition is a foundation book in the practice of competitive intelligence and the use of this intelligence for business advantage. 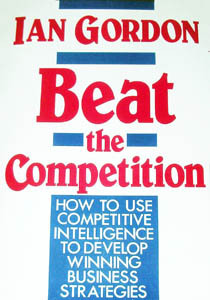 At a time when the words competitive intelligence were not in general use, Beat the Competition was among the first books to describe why competitive intelligence could add business value and specifically how to conduct competitive intelligence. While market research explores demand-side issues, competitive intelligence as discussed in this book assesses the supply landscape and the key factors that determine competitive success before exploring individual competitors and how to beat them. The book defines competitive intelligence as the process of obtaining and analyzing publicly available information to achieve the objectives of an organization by facilitating organizational learning and improvement, differentiation and competitor targeting. Detailed tools in the conduct of competitive intelligence are discussed as well as interesting examples that have landed some companies in hot water. One of the first books on competitive intelligence in the first to place competitive intelligence in strategic context, Beat the Competition provides detail on the establishment and management of a competitive intelligence department, what the role of competitive intelligence should comprise, how to conduct competitive intelligence while keeping practices above board, and how to gain strategic insight. Importantly, the book notes that competitive intelligence is the process of finding answers to thoughtful questions and not simply securing a wide variety of information about competitors. 3.1 How many competitors should be monitored and analyzed? An excellent primer for learning how to do competitive analysis. The approach is practical and very useful. The book also provides a good compendium of real life sources. The ideas in this book are exceptionally tough and useful. Any CEO and marketing manager should read it. The “shadow marketing” method is alone well worth the price of the book. The author offers marketers sensible advice on how to collect needed data internally and through external sources -- without stepping into the unseemly sphere of industrial espionage.